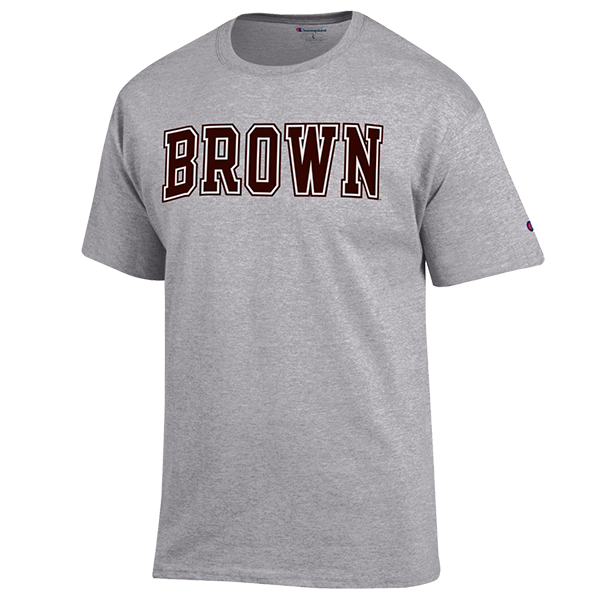 47 Brand 50% cotton, 50% polyester tee with 'BROWN' in sewn-on fabric letters with white fabric outline on front and 'B' in sewn-on fabric letters with white fabric outline on left sleeve. --Cardinal Tee has charcoal sewn-on letters with white and charcoal outlines. --Charcoal Tee has cardinal sewn-on letters with white outline. 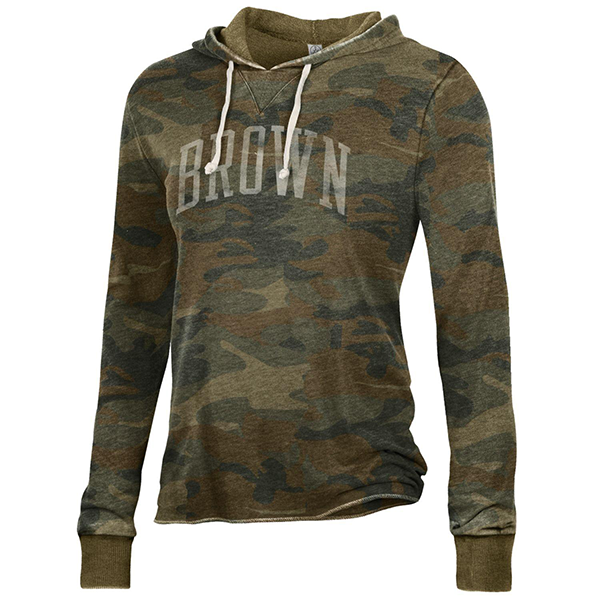 Please select option for 47 Brand 'B' on Sleeve Tees - $36.99. 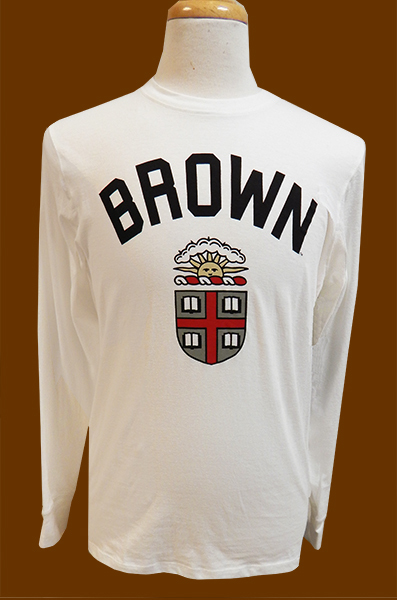 47 Brand 100% cotton black long-sleeve tee with distressed imprint of 'BROWN' in white above cardinal and white Crest. 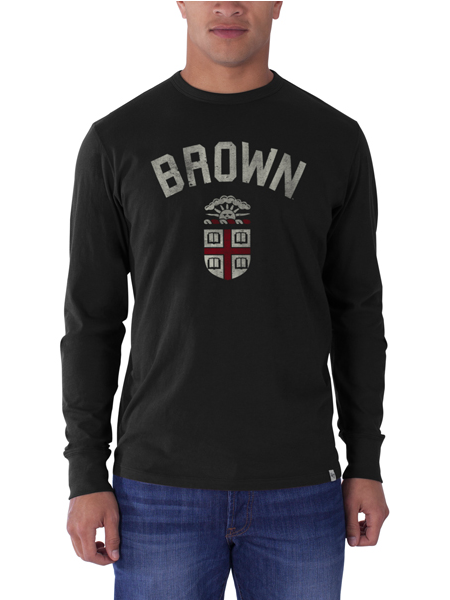 Please select option for 47 Brand Black Crest Long-Sleeve Tee - $39.99. 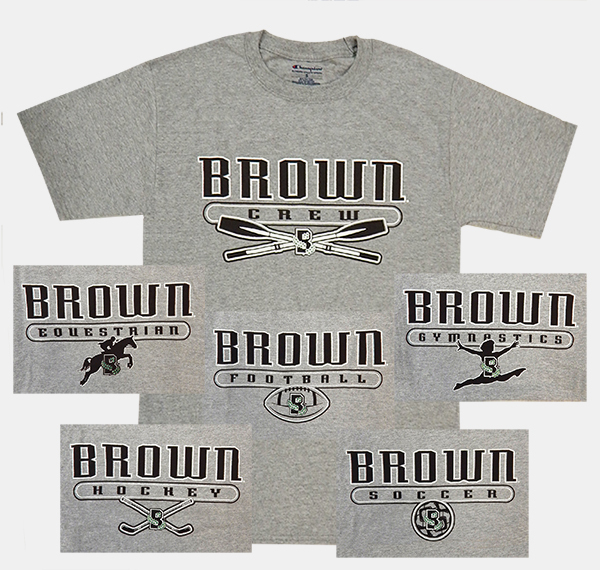 47 Brand 100% cotton brown tee with distressed imprint of 'BROWN' in white above grey, cardinal, black, white, and gold Crest. 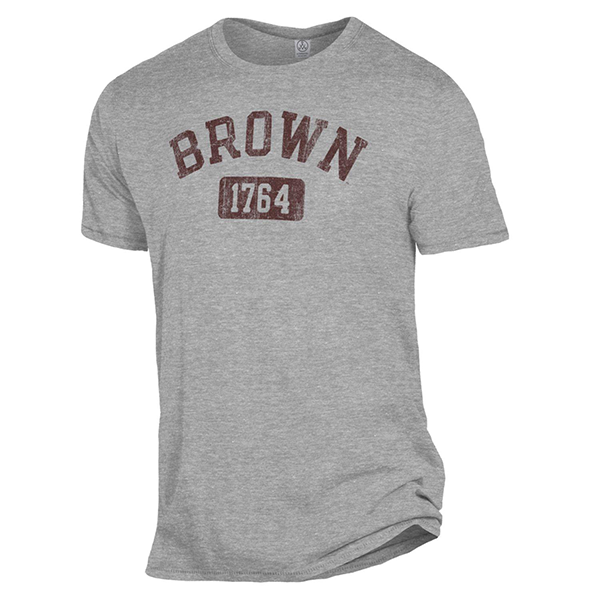 Please select option for 47 Brand Brown Crest Tee - $36.99. 47 Brand 100% cotton cardinal tee with distressed imprint of 'BROWN' in white above grey, cardinal, gold, black, and white Crest. 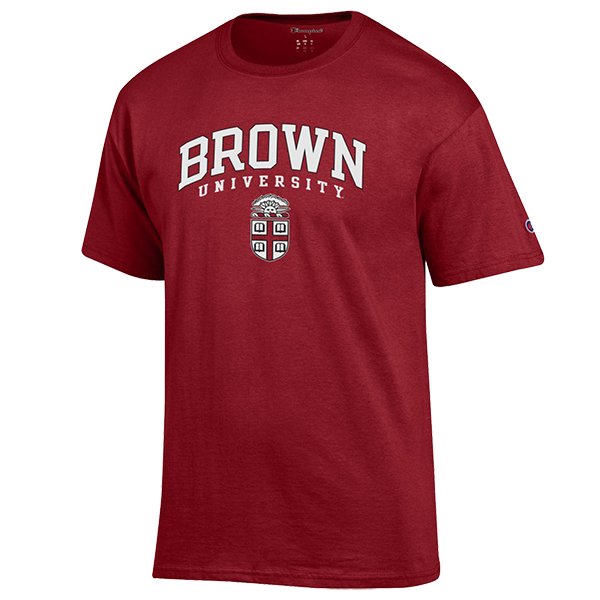 Please select option for 47 Brand Cardinal Crest Tee - $36.99. 47 Brand 100% cotton grey tee with distressed imprint of 'BROWN' in cardinal above cardinal, black, white, and yellow Crest. Please select option for 47 Brand Grey Crest Tee - $36.99. 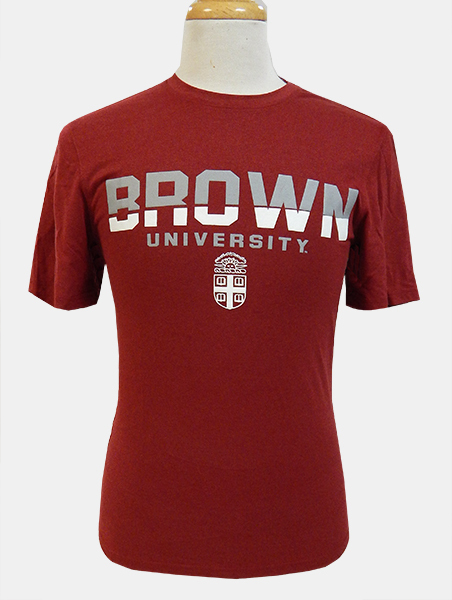 47 Brand 70% cotton, 30% polyester tee with imprint of large Crest. 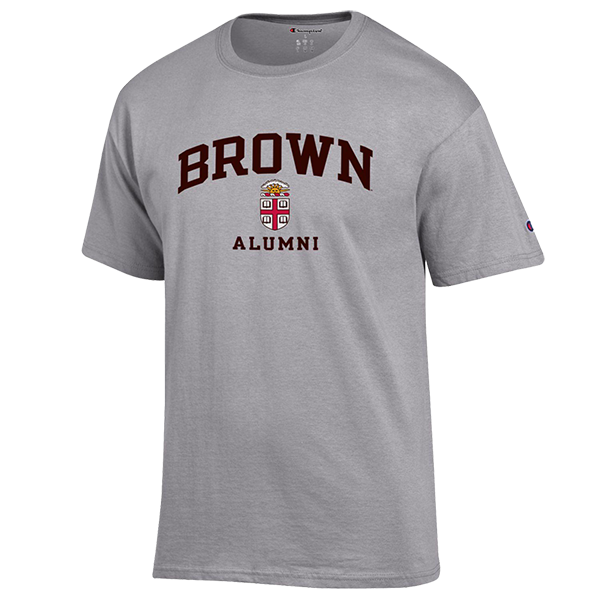 --Grey Tee has large imprint of cardinal, black, white, and gold Crest above 'BROWN' in black. 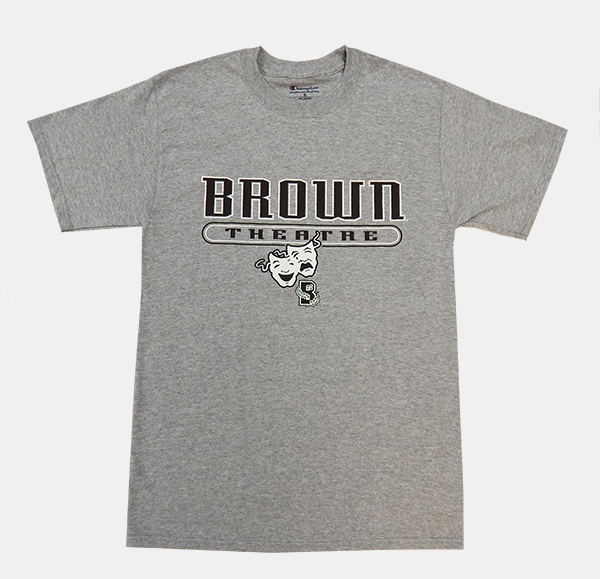 --Navy Tee has large imprint of grey, cardinal, black, white, and gold Crest above 'BROWN' in white. Please select option for 47 Brand Large Crest Tee - $29.99. 47 Brand 100% cotton white long-sleeve tee has 'BROWN' imprinted in black above dark grey, cardinal, black, white, and gold Crest. Please select option for 47 Brand White Crest Long-Sleeve Tee - $39.99. Adrenaline Run/Tri 100% polyester white mesh singlet with brown mesh side panels and red trim at neck and armholes. 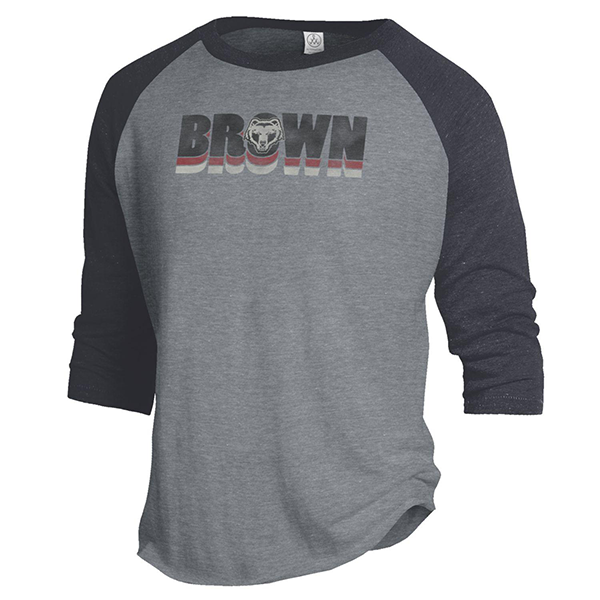 'BROWN' imprinted in brown with black outline above brown, maroon, red, black, and white Bear mascot with black outline on front. 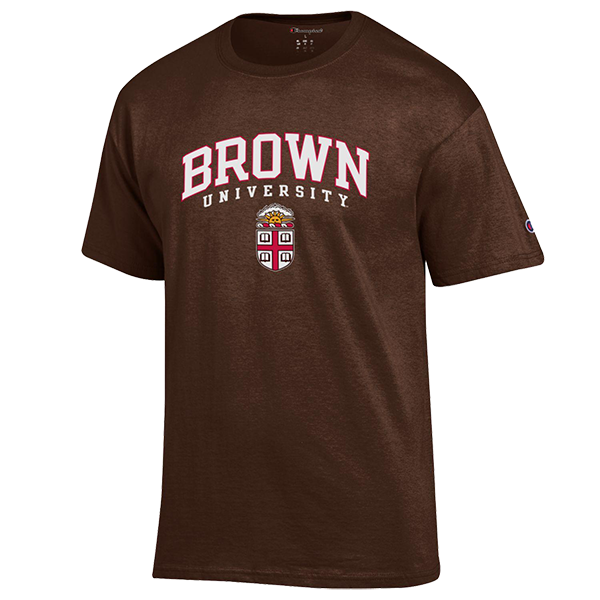 Large brown 'B' with black outline entwined with green ivy with black outline on back. 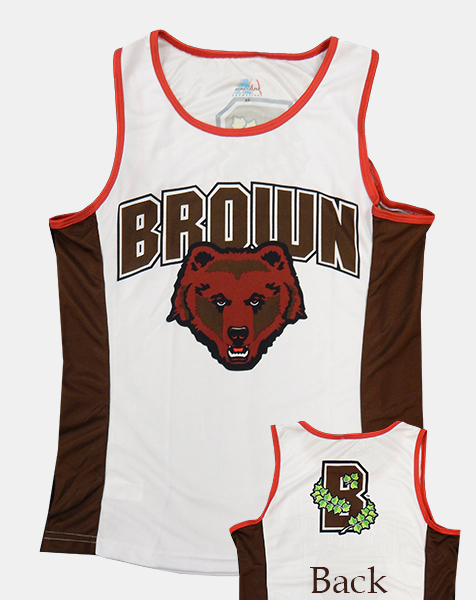 Please select option for AD White & Brown Run/Tri Mesh Singlet - $49.99. Please select option for Champion Basic 2-Color Tee - Gray. Please select option for Champion Basic 2-Color Tee - White. 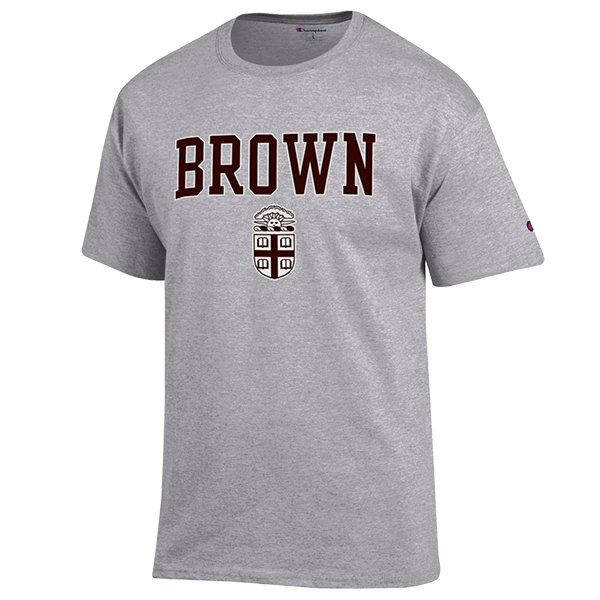 Please select option for Champion Basic Tee w/Brown Over Crest. 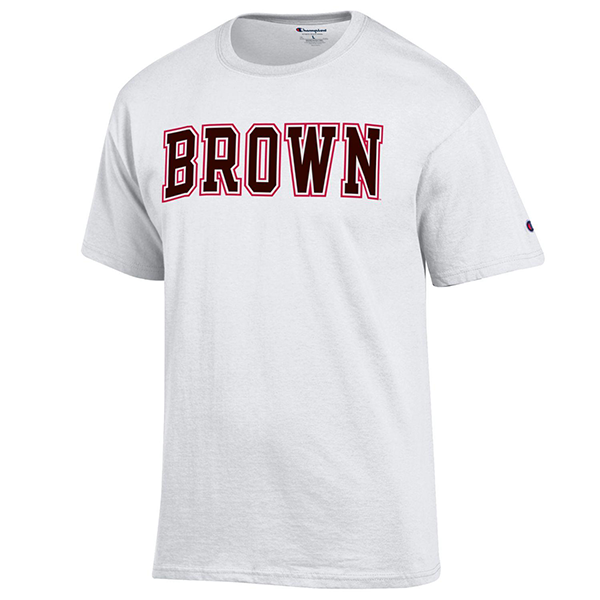 Please select option for Champion Basic Tee w/University Crest - White or Brown. 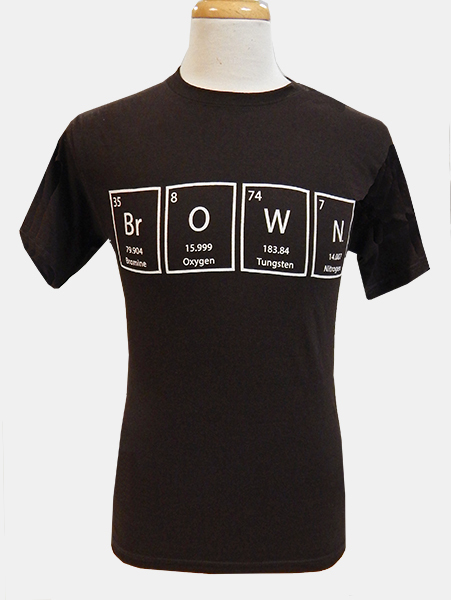 Champion 100% cotton, brown tee with Brown imprinted in white in the elements of the periodic table: Br = Bromine, O = Oxygen, W = Tungsten, and N = Nitrogen. 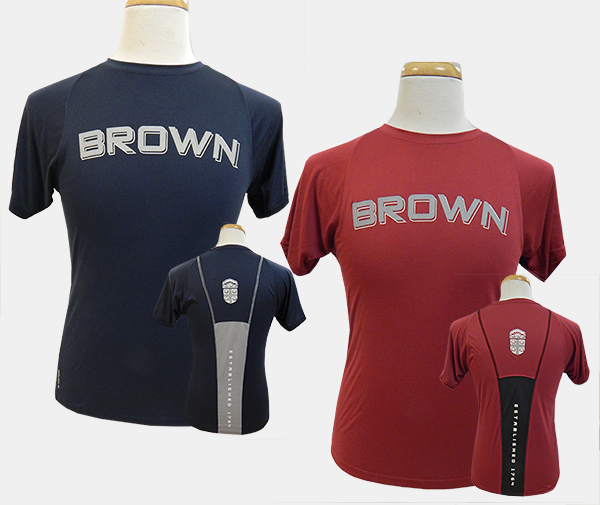 Please select option for Champion Brown Elements Tee - $21.99. 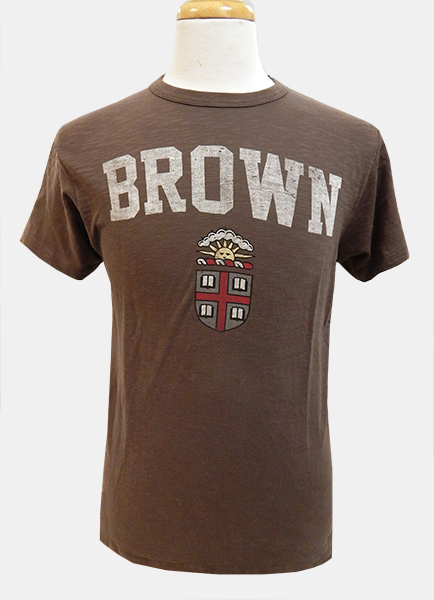 Champion brown 100% combed cotton short-sleeve tee with "brown" imprint. 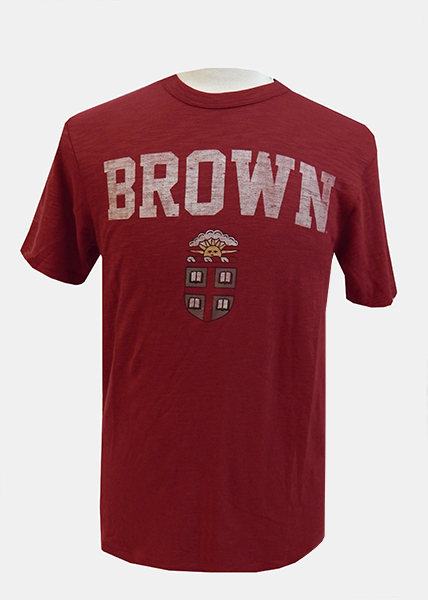 Please select option for Champion Brown Short-Sleeve Tee - $19.99. 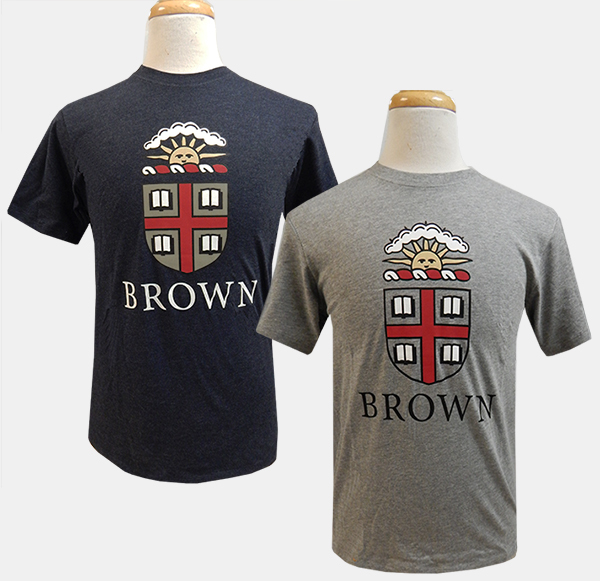 Please select option for Champion Brown University Crest Tee. 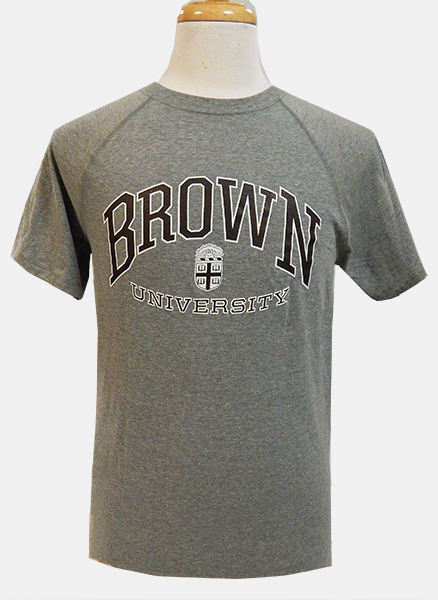 Champion 100% polyester cardinal tee with 2/3 grey and 1/3 white imprint of 'BROWN' above 'UNIVERSITY' in grey above white Crest. Please select option for Champion Cardinal Crest Tee - $27.99. 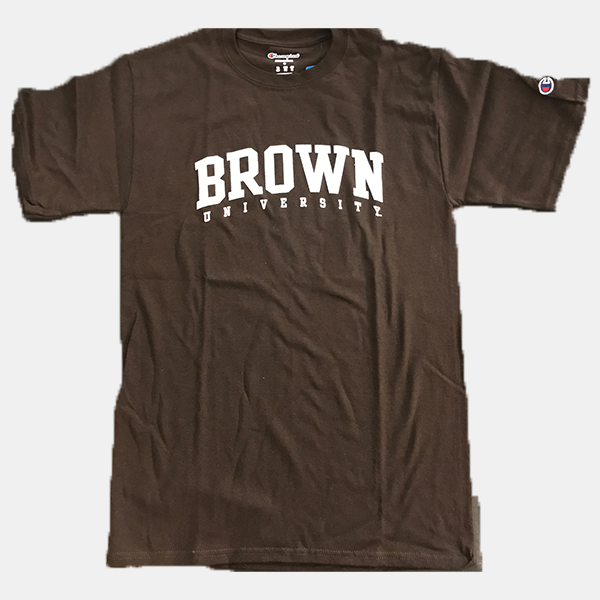 Champion 60% cotton, 40% polyester, charcoal long-sleeve tee with 'BROWN' imprinted in white above 'UNIVERSITY' in dark brown above dark brown and white Crest. Please select option for Champion Charcoal Crest Long-Sleeve Tee - $29.99. Champion 100% polyester grey tee with grey and charcoal striated sleeves, neck trim, and vee at neckline. 'BROWN' imprinted in black above black Crest above '1764' in cut-out numbers on black banner above 'UNIVERSITY' in black. Please select option for Champion Grey Crest Est. Tee - $26.99. 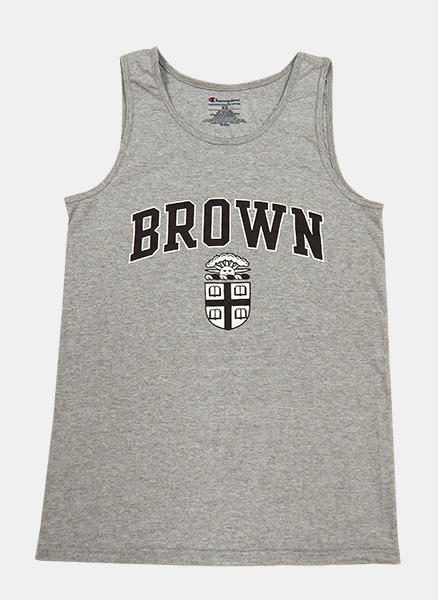 Champion 90% cotton, 10% polyester light-grey tanktop with 'BROWN' imprinted in dark brown with white outline above Crest in dark brown and white. Please select option for Champion Grey Crest Tanktop - $21.99. 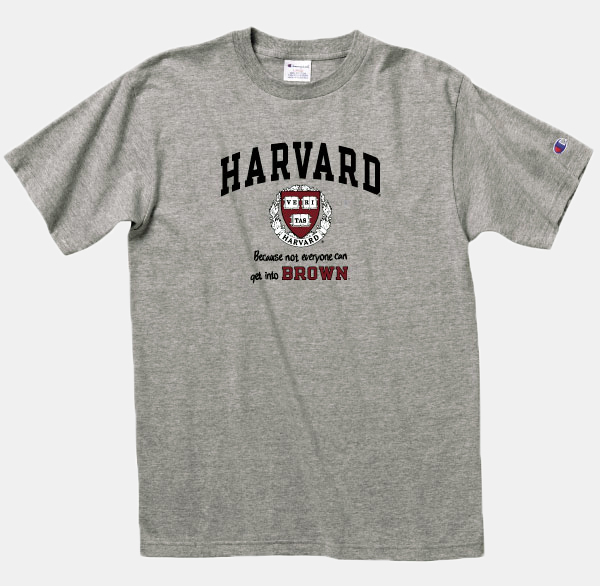 Please select option for Champion Grey Harvard Tee - $19.99. 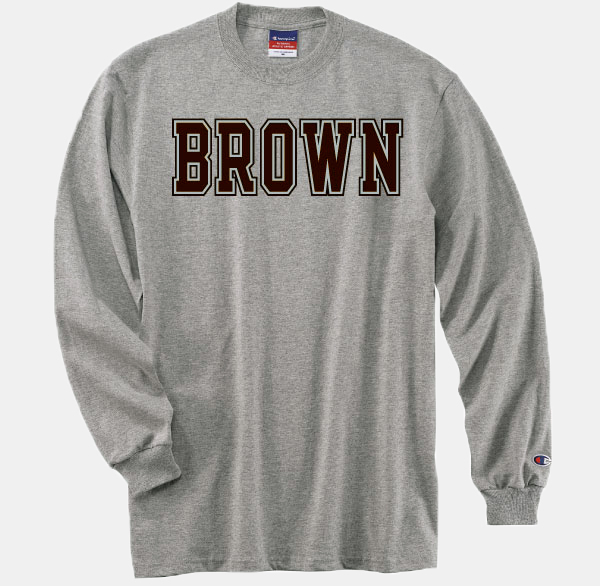 Champion heavyweight (90% cotton) heather grey long-sleeve tee with Brown imprint. 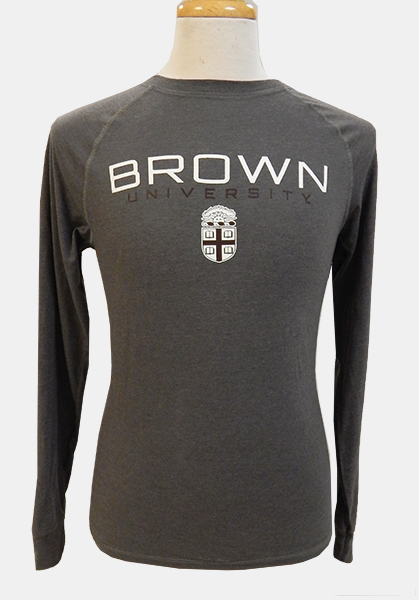 Please select option for Champion Grey Long-Sleeve Practice Tee - $26.99. Heavyweight (90% cotton). 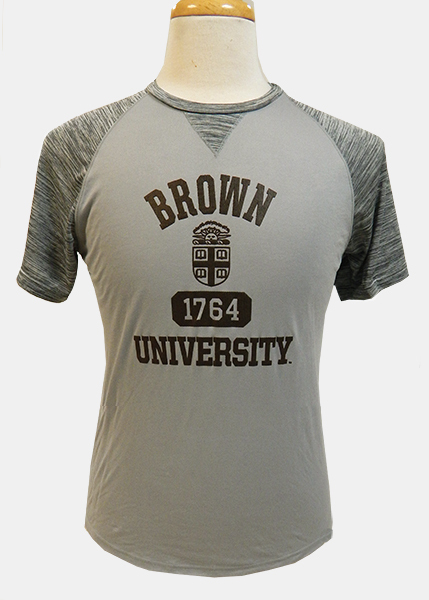 Heather Grey with Brown imprint. 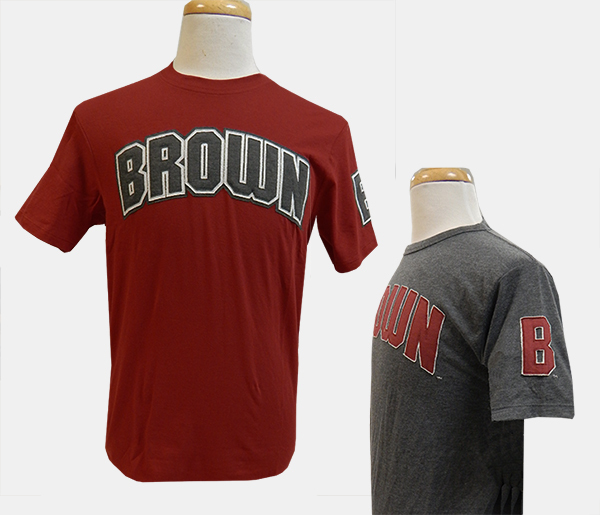 Please select option for Champion Grey Short-Sleeve Practice Tee - $19.99. --Gymnastics in Small and Medium only at this time. --Soccer not available in 2X at this time. --Softball not available in 2X. --Squash not available in 2X at this time. Please select option for Champion Grey Sports T.2 - $21.99. 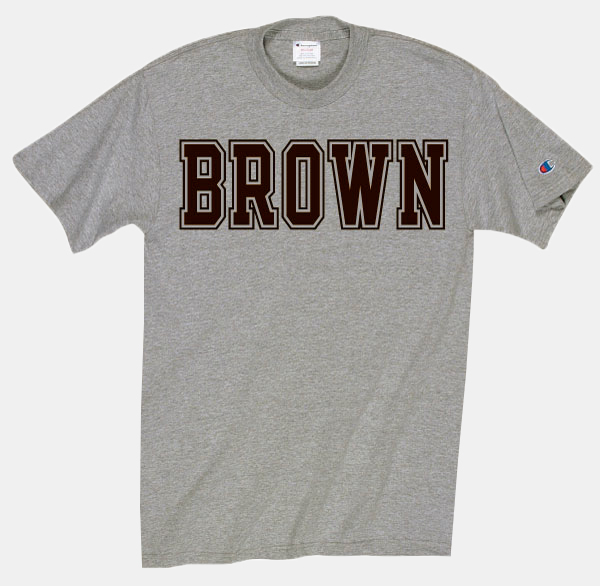 Champion 60% cotton, 40% polyester grey tee with 'BROWN' imprinted in dark brown with white outline above dark brown and white Crest above 'UNIVERSITY' in dark brown with white outline. 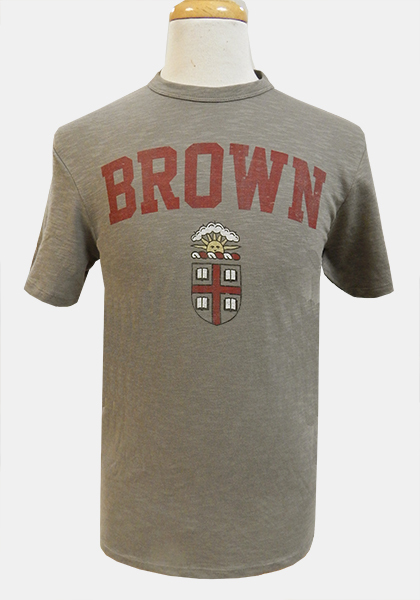 Please select option for Champion Grey University Crest Tee - $24.99. Champion Powertrain, 100% polyester tee with mesh insert on back has Vapor technology, quick dry for comfort. --Cardinal/Black Tee - Cardinal tee with black mesh insert on back and black top-stitching has 'BROWN' in grey with white drop-shadow outline on front, grey and white Crest on upper back, and 'ESTABLISHED 1764' imprinted in white down black mesh insert. --Navy/Grey Tee - Navy tee with grey mesh insert on back and grey top-stitching has 'BROWN' in grey with white drop-shadow outline on front, grey and white Crest on upper back, and 'ESTABLISHED 1764' imprinted in white down grey mesh insert. Please select option for Champion Powertrain Color Block Est. Tee - $32.99.